Client (php script) curls away a post request to the above server. POST is a string (json), about 4 megabytes in size. When I take a look at the memory usage of the node process (done in Activity Monitor, mac app) - it reports that the node server memory usage is geting larger for every request. So after 20 requests or so memory usage is doubled. This is not a bug. It's normal, expected behaviour. To demonstrate this behaviour for you, I ran the above script with node.js 0.8.8 on Windows and bombarded the server with large HTTP POST requests. 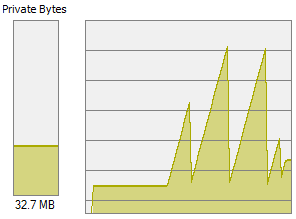 As you can see, the memory usage goes up, until a certain limit that triggers garbage collection. After the cleanup, the usage is reset and starts again climbing until the next triggering.